There’s something about a historic lighthouse that can transport you back in time in an instant. Two different kinds of historic lighthouses occur throughout the barrier islands, and maritime aficionados will enjoy visiting both of them. The Outer Banks has three tall or “coastal” lighthouses that were built to warn passing ships about dangerous offshore shoals: Bodie Island lighthouse (built in 1872), Cape Hatteras lighthouse (built in 1869), and Currituck Beach lighthouse (built in 1875). The two “harbor lights” lighthouses were built to help ships pass through to safe anchorage: Bald Head Island lighthouse, or “Old Baldy,” was built in 1797 and Ocracoke lighthouse was built in 1823. As you tour these lighthouses and take in the unique and rugged geography around them, you’ll get a real appreciation for why lighthouses are such a beloved part of North Carolina’s history. Kayaking is a truly special way to experience the Outer Banks. Miles and miles of calm waters and pristine beaches invite you to explore. Guided kayak tours are available throughout the islands, and tour exertion levels can scale up or down to fit almost anyone’s ability. Before you begin your kayak tour, an experienced guide will show you how to safely and easily navigate your kayak, and will give you an overview of what you can expect to see. Popular kayak tours include gliding past downtown Manteo and Ocracoke Village, birding and nature tours through quiet canals, taking in spectacular sunsets, and dolphin spotting. Kayak tour companies are spread throughout the Outer Banks, and the largest is Kitty Hawk Kites. Kitty Hawk Kites has a variety of popular tours, so it’s a good idea to call in advance to reserve your spot for their nature, sunset, or overnight pack trips. One of the biggest draws to the Outer Banks is offshore fishing for large fish such as tuna, swordfish, and mahi-mahi. Charters accommodate groups of up to six people, so splitting expenses with two other couples or another family is a nice way to make this a cost-effective activity. Your charter captain will take you out to the Gulf Stream at dawn, an exhilarating experience in itself, and set you up with everything you need to land a good fish story — and a delicious dinner. Bring plenty of food, drinks, sunscreen, and motion sickness remedies. White, long-sleeved shirts, polarized sunglasses, and sun hats are also a good idea. Standup paddleboarding is a relaxing way to experience the Outer Banks from the water. Paddleboarding is easy to learn and can be adapted for almost any fitness level. As one of the largest watersports outfitters, Kitty Hawk Kites rents paddleboards, provides lessons, and offers paddleboard tours of Kitty Hawk, Duck, and Manteo. You’ll receive about 15 minutes of simple instruction heading out behind your tour guide through the peaceful Sound waters. Paddleboarders frequently have close-up dolphin encounters, so just relax, paddle slowly, and enjoy the views. Speaking of dolphins, Outer Banks dolphins have a reputation for being just as excited to see people as people are to see them. 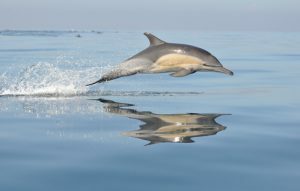 A daytime or sunset dolphin cruise is the best way to spot friendly Atlantic Bottlenose dolphins as well as seabirds, turtles, and other wildlife. Paradise Dolphin Cruises is a popular dolphin-spotting choice for Outer Banks visitors. Their large catamarans are comfortable, shaded, and handicapped accessible, and their captains have a solid reputation for finding as many dolphins as you care to see. With the top down, the sun on your face and the wind in your hair — is there a better way to experience Nature’s beauty than from a classic safari Jeep? Jeep tours in the Outer Banks allow you to cover plenty of ground while keeping you connected with the sights and sounds of these special surroundings. Corolla Jeep Adventures offer several ways to experience the Outer Banks from a safari Jeep. You can even reserve a Jeep for a 25-mile off-road self-guided tour where you’ll see wild horses, historic villages, lighthouses, and much more. Touring the Outer Banks by land or sea is the perfect way to get to know North Carolina’s barrier islands. 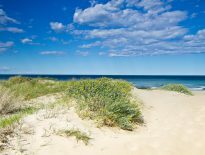 Whether you take a leisurely self-guided tour or follow an experienced guide along local roads, trails, or canals, a tour of the Outer Banks will be an enriching experience you’ll never forget. Previous Previous post: Through a Kid’s Eyes: Memory Monday August 8, 2016. Next Next post: Two Memory Monday Photos: Memory Monday August 15, 2016.